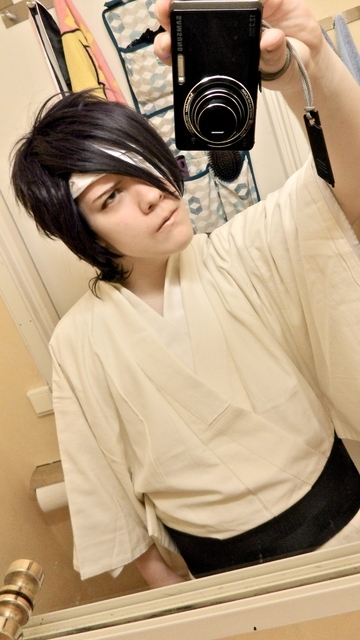 Shiro Samurai's Cosplay: Rokuro preview + My Desucon journey starting soon! Rokuro preview + My Desucon journey starting soon! By the way I've finally got the mirror mounted into the new apartment so now I could take some preview photos alone. Sorry about the photos being mirrored (everything is reversed..), the mess in the background and the yellow lighting. Oh well, enough rambling, le photos coming in! Very chill cosplay to wear.. and everything for it is from my kimono closet w00p! Oh, and one thing - Rokuro sports violet eyes but because of this being a Sunday cosplay I don't think I'll bother with using contact lenses. The reasoning? It would be a hassle after the con is over because I will be traveling back home north and yeah, I don't gusta the thought of wearing contacts during a long car trip or alternatively removing them in a) a crammed con toilet b) in some random gasoline station or whatnot stop along the way. Just.. no, especially considering I'm still pretty new to using contact lenses and it's so important to have clean hands and stuff. Just not worth the trouble I think.. but I will for sure wear contacts whenever I have a proper photoshoot with this cosplay someday. 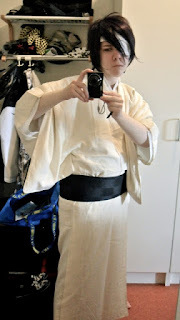 Well well, seeing how my Desucon journey starts already tomorrow evening I guess it's safe to assume I won't write any more blog posts until after the con sooooo..
Nice work! Have an amazing con!